Ringing in the new year Japanese-style ... in the U.S. 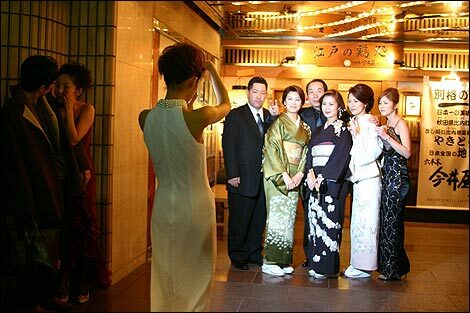 Among those who celebrate Japan's Oshogatsu (New Year's) in the U.S. are not only Japanese-Americans but also people who've lived in Japan and those who've never been but are enamored of Japanese culture just the same. Alexandra Clayton poses with her family's hagoita, a decoration brought out at New Year's time. A traditional bronze bell of the type used to ring in the new year in Japan... except this particular one is in the Asian Art Museum in San Francisco. Scientist in Japan are working to prevent rising temperatures from affecting the country's rice crop. Before he became a martial arts superstar, Bruce Lee attended the University of Washington, so it would only seem nature to build a statue to the martial arts legend there, but strangely, it hasn't happened yet. After all, you would think the admissions office would be keen on the idea. Q: What drink did Bruce Lee order in a restaurant? 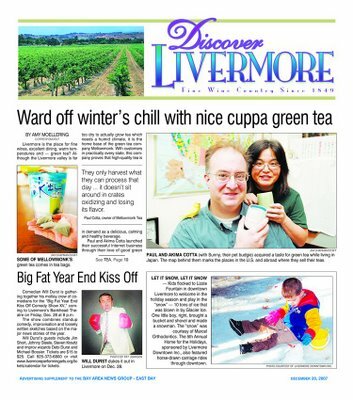 A local newspaper has run a story about Mellow Monk! Sorry, gents, she's taken. (He's taken, too, ladies.) ladies. Here you can see a picture of two growers and their kids. Mr. and Mrs. Monk have children, too, but they refused to be photographed with us. The current upswing in world food prices is particularly worrying to Japan, which imports a big chunk of its foodstuffs and so ranks 124th in the world in food security. Part of the problem is the shift in recent years to more Western-style foods, especially among young people, many of whom prefer burgers to broiled fish or—say it ain't so!—bottled green tea to traditional brew-it-yourself tea. Much of this bottled tea is made from tea leaves grown on massive corporate farms in places like China or Brazil, but not Mellow Monk: our tea is grown on family-owned and -operated farms in Aso, Japan. 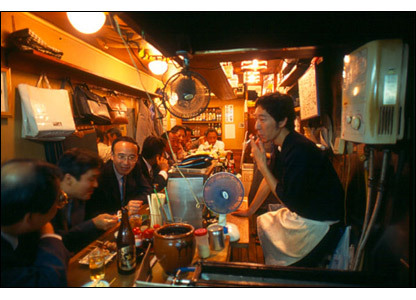 At a small eatery near Shinjuku Station in Tokyo, office workers wind down with food and drink before heading home. Railway TV is streaming video taken from the front of an actual train plying the rails in Japan. Just FYI: you need to have Flash verion 9 installed to see the video. 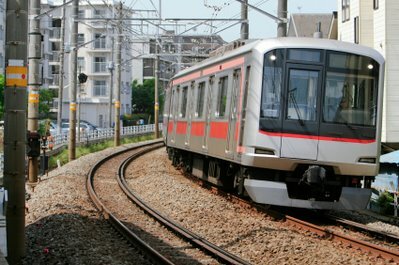 Your typical Japanese commuter train. 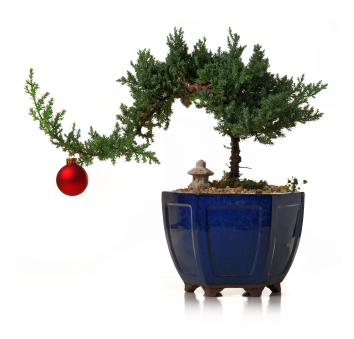 From everyone at Mellow Monk's Green Teas, here's wishing a happy and mellow holiday season to you and yours. When you get chilled to the bone on a cold winter's day, there's nothing like a nice hot bath to raise your core temperature. Well, capybaras apparently appreciate a hot bath, too, because as the photos below show, the capybaras of Izu Shaboten Park in Ito City are famous for the hot yuzu baths they seem to enjoy so much in wintertime. Yuzu are often plopped into baths for the wonderful natural fragrance they impart to the waters, and for the smooth feeling that the citrus oils impart to the skin. By the way, a "yuzu bath" is also a cocktail. Guys, a word of advice: If people start adding sliced-up carrots and onions to the water, GET OUT! The term "sushi cake" can mean one of two things: (1) a cake that looks like sushi or (2) sushi that looks like a cake. However, more and more kids in Japan are allergic to milk, eggs, or wheat—the prime ingredients of cake. In fact, one source I came across says that 10 percent of kids in Japan can't eat cake because of an allergy to one or more of the ingredients. The cause, some say, is the Westernization of the Japanese diet and the chemical additives used in Japanese mass-market foods in general. Consequently, parents of kids with allergies had given up on Christmas cakes—until someone hit on the Zen-like idea of a cake that isn't a cake. That someone was a Mr. Toyoshima, owner of Enmusubi, a bakery in Nagasaki that makes the cake in the photo below. Mr. Toyoshima said he was inspired by sad stories that customers told him of their allergic kids celebrating their birthdays by sticking candles in manju. Mr. Toyoshima's sushi cake is made with pressed sushi rice and slices of ham, cucumber, and strawberries (but no fish). Even kids with the most common food allergies can dig in. "I want kids to believe that Santa sees all children as equal," he explains. If you live in Japan, you can buy one of these cakes online. And if you're passing through the Suzuka area of Nagasaki, you can pick up one of these sushi cakes at the Suzuka Pass Farmers Market [Japanese-only website]. Mr. Toyoshima's surprisingly scrumptious-looking sushi cake. If you ask nicely, you might be able to get your local sushi chef to make one for you. Last year, Smirnoff released a comedy viral video called "Tea Partay" featuring made-up East Coast rap group Prep-Unit. This year the company released a sequel—a West Coast version called "Green Tea Partay" sung by the also made-up group Boyz in the Hillz (as in Beverly Hills). Just think how impressed your kids will be when they find out you know what "Green Tea Partay" is. some things you can do to bump up your sack time. "The Japanese are right in their assessment that you work better after a nap than before it. There's a degree of machismo about it, you're saying look how hard I've worked. But that's better than the macho rituals we have over here, like how late you can send a work email to prove how long you've been working." 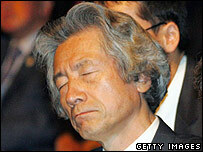 Japan's former Prime Minister Koizumi resting his eyes. Kegon Falls (Kegon no Taki), located in Nikko, are one of Japan's three highest waterfalls. You can click here for more pictures of Kegon Falls' beautiful fall foliage and rock formations, for which the area is famous. There's also a collection of videos of Kegon Falls here. The majestic Kegon Falls of Nikko. A reader recently asked this question: Do eco-friendly farming practices [such as those of our growers] have an impact on the taste of the harvested tea? Most definitely! For instance, letting the tea plants grow naturally (instead of speeding growth with fertilizer and whatnot) lets all of the natural flavor-enhancing compounds develop to their fullest. Our growers water their tea groves with only rainwater from the sky, which avoids "diluting" the tea leaves in the same way we've all experienced firsthand in hydroponically grown grapes. Also, at harvest time, our growers harvest only what they can process right away. This stops oxidation and fermentation, locking in the flavor (and all the healthy antioxidants). On huge corporate farms, harvested tea sits around fermenting in huge piles before being processed. 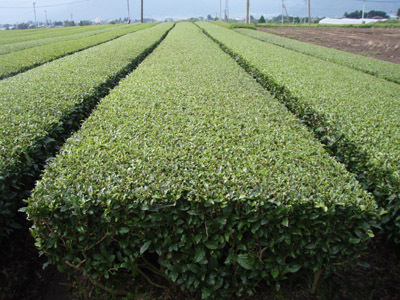 For the same reasons I mentioned above, small-farm green tea is also healthier for you: since it's processed immediately after harvest, tea like ours has more EGCG and other antioxidants. The fermentation that occurs in large piles of harvested tea not only destroys the natural flavor-enhancing compounds, but also breaks down antioxidants, too. This just shows, Grasshopper, that sometimes, such as when making tea from harvested leaves, an overly mellow approach is not necessarily the best approach. Processed right after harvest, locking in the flavor and all the healthy antioxidants. 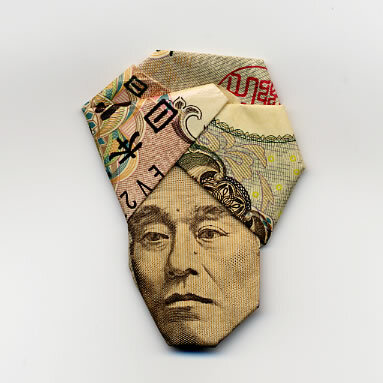 "Moneygami" is the English name given to Japanese currency folded origami-style so that the person on the bill looks like he/she is wearing a hat. The title of this one is "Yukichi just out of the bath" ... and it really is made from a single 10,000-yen note. I know Burger King isn't exactly a paragon of healthy eating, but this is still a funny commercial. However, your take on this commercial might be slightly different than the average person's if you grew up on a farm and have traumatic childhood memories of being chased and kicked by a rooster (as happened to the Missus). I recently received an email asking about the health benefits of green tea, so I am posting my reply here. So a way to get citrus juice into you tea would be to brew a pot of tea with a couple of pieces of dried orange peel (which is actually an Asian custom that goes back hundreds of years) or squeeze a couple of drops of citric acid from a fresh orange peel into your brewed tea, or just drop an orange or lemon wedge right into your tea. In fact, that sounds so yummy, I think I'll do that right now! 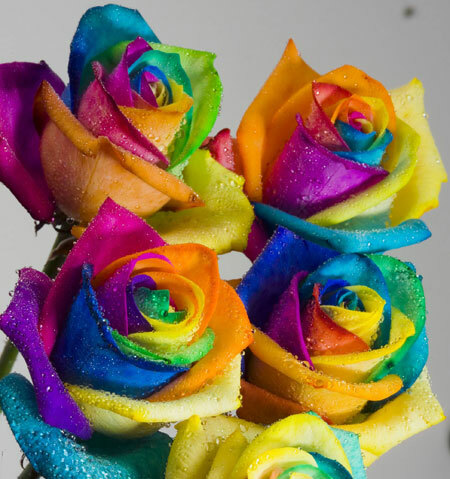 Thanks for all your inquiries. Here's a trailer of the documentary "All in This Tea," which chronicles the journey of an American tea buyer through small villages in rural China. At the Aqua Toto Gifu aquarium (famous for its mudskippers), an electric eel powers Christmas tree lights outside of its tank via a copper wire. Mr. Eel on the job. Michelin has finally released a guide to restaurants in Tokyo. I wonder how many stars Yoshinoya in Asakusa got. If your youngster has a cough that keeps him or her awake at night, forget about cough syrups with questionable ingredients—researchers at Pennsylvania State University's College of Medicine found that good old-fashioned honey works better. There's also an accompanying video. The final score: honey bears 1, cough syrup 0. "Sasuke" (a.k.a. "Ninja Warrior") is an obstacle course reality TV game show from Japan—one of Japan's most popular TV exports since "Iron Chef." 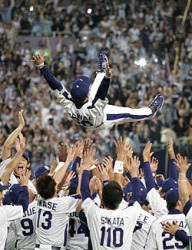 Below are a two of clips of "Sasuke": (1) the best wipeouts and (2) the "Tiny Dancer" a.k.a. Yuriko Imamura, said to be Japan's number-one aerialist/acrobatic dancer. File this story under Say it ain't so. In the 1960s and '70s, electronics manufacturers congregated in Tokyo's Akihabara district. It wasn't long before the area became proliferated with discount electronics shops supplied by these manufacturers, making Akihabara the place to go for incredible bargains on all devices electronic. Later, because of this electronics connection, the area transformed into a veritable geek paradise, filled with video game arcades, manga book stores, and even cosplay restaurants. Naturally, Akihabara is a great place to people-watch. Even foreign tourists make a special trip there to see the show—or to parade around in their own costumes. But then Akihabara got a little too famous for its own good: it became trendy—and you know what that means. Even now, as you read this, upscale businesses are moving in, rents are going up, and the funky stores that gave the place its charm are relocating. So Japan's otaku are looking for a new place to hang out. Built as a memorial to Tokugawa Ieyasu, the Toshogu Shrine in the city of Nikko is today famous for its many exquisitely crafted architectural wonders. 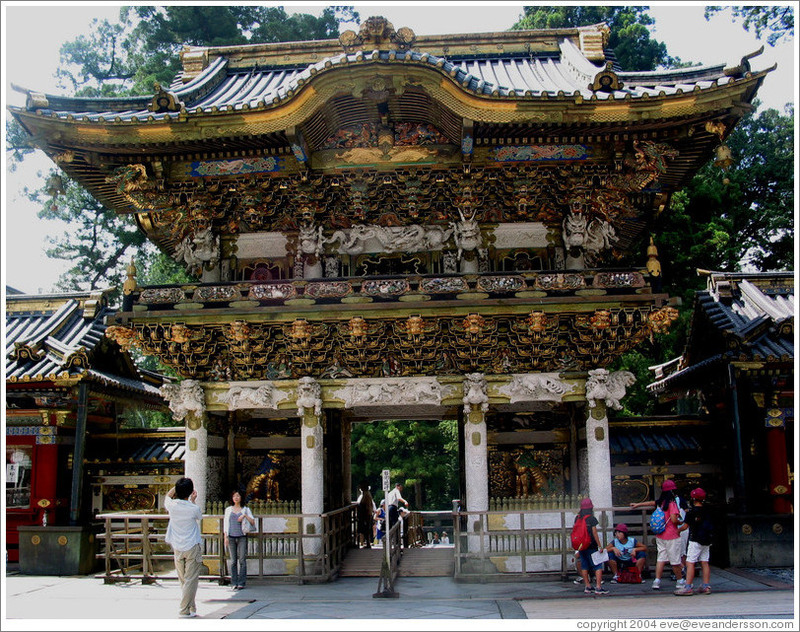 One of the most lavishly made structures there is the Yomeimon Gate, whose 12 wooden pillars are engraved with a curled pattern known as gurimon. 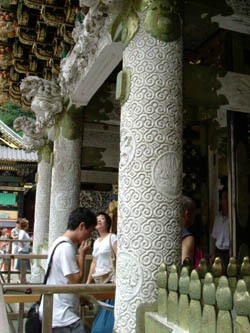 The pattern on one of these pillars is inverted compared to the others; such a post is called a sakabashira (inverted pillar) and is intended to ward off evil spirits. 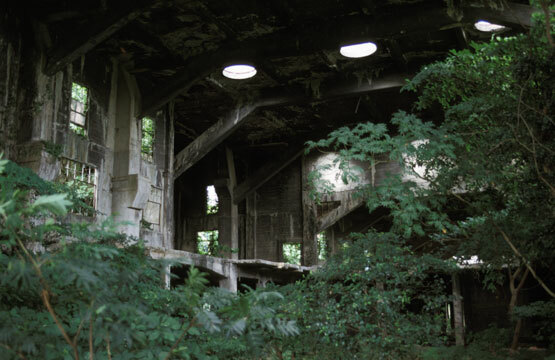 This custom is related to the old Japanese saying, “Once a building is completed, its destruction begins.” By installing a pillar upside-down, the builders of Toshogu Shrine may have thought they were permanently postponing the shrine’s completion. That nearly all of the shrine’s structures are still so well preserved 400 years later could be a testament to the inverted pillar’s effectiveness. The most common type of water heater in Japanese homes is the on-demand water heater, also known as the tankless or instantaneous water heater. This usually wall-mounted device doesn't heat the water until you open the faucet, after which the water is rapidly heated and dispensed. These water heaters are cheaper to run and use less energy than storage water heaters. I've seen a lot of these water heaters in action in Japan, and most models, especially the newer ones, are simply great—well designed, well built, and as reliable as can be. But some models, especially older ones, can be tricky. And every once in a while, you'll run into a water heater that can turn an ordinary shower into a shower from Hades. 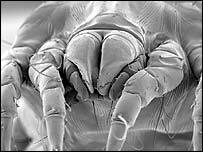 A close-up of the Monster. One of the products featured at Japan Expo 2007 in Los Angeles this past weekend was a tea room kit [link to Babelfish translation; original Japanese article is here]. The kit is made in Tottori, Japan by a construction company called Wakobo Gu (和工房「寓」) and is the brainchild of the company's president. The kit is made of pine from Tottori Prefecture and is seen as a way to promote the prefecture's products outside of Japan. According to Wakobo Gu, the tea room can be assembled in about an hour. 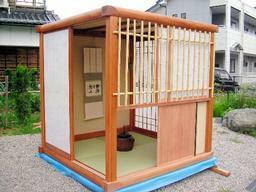 For the two-tatami-mat-sized tea room the price is ¥723,450, or $6,548.47 at today's exchange rate. The press release states that the company will ship anywhere in Japan but doesn't say anything about foreign orders. If you want us to inquire for you, drop us a line. It's your own private tea world. Nice (except for the blue tarp). Another view of Wakobo Gu's tea room kit, with the company's president. I recently received a sampling of teas from auraTeas, a British Columbia-based importer of teas from Taiwan, so here is my review of the first of tea I sampled, Formosa Wenshan Baochong Choice. Bottom line: I really liked this tea. It has a subtle but definite (if that makes sense) oolong aroma and flavor, which is to be expected as it is an oolong tea. I was surprised by the instructions on the tin to let the tea steep for only 1 minute (for green tea, the average is 3 to 5 minutes); I was equally surprised that such a short steeping time produced such an aromatic infusion. For the second infusion (the label suggests up to six) I let the tea steep a little longer and was again surprised—this time at how flavorful the tea was for a second steeping. The flavor still held up for a third infusion, without any of the unpleasant overtones that will come out in an inferior tea. In short, this tea is the real deal. 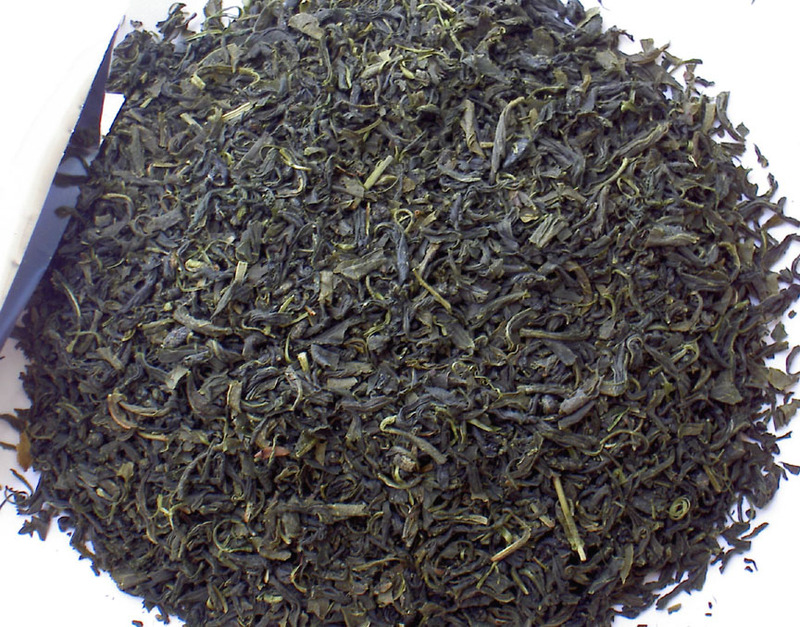 If you like oolong—but not overpowering oolong—then you'll love this tea. I highly recommend it. Here's a cool factoid about Japanese movie great Toshiro Mifune: In 1994, when he was 74 years old, Toshiro appeared in a small independent American film. The film, Picture Bride, is about a young Japanese woman who in 1918 is sent to Hawaii to marry a man she's never met. This compelling, well-made film began life as a short-film project while the writer-director, the late Kayo Hatta, was still in film school but expanded into a full-length feature when Ms Hatta realized the story was too important for a short. Here's where Toshiro Mifune comes in. Before filming of Picture Bride began, Kayo Hatta wrote to Mifune asking if he would appear in the role of the benshi, a professional narrator of silent films. She knew the letter was a "Hail Mary" pass and later said she never expected Mifune to say yes. But that's exactly what he did. You can read about the filming of Picture Bride here. 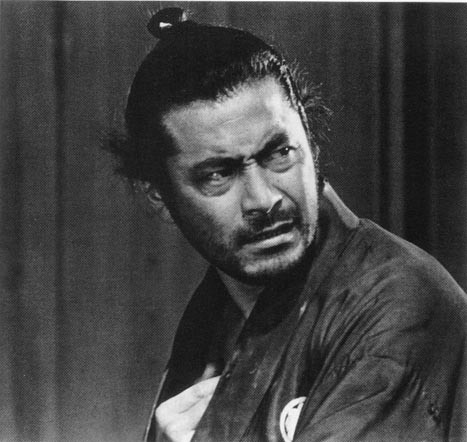 Mifune in 1962's Sanjuro, sequel to Yojimbo. Wheatgrass juice has long been popular in Japan as a health drink. 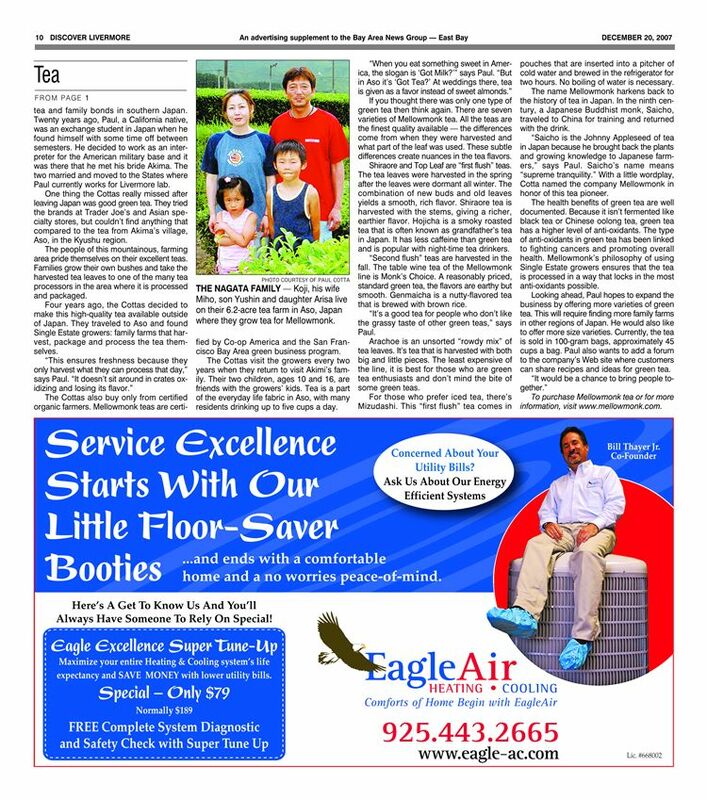 Of course, small children run screaming from the stuff, but plenty of health-conscious people all over Japan gleefully quaff the beverage daily and swear by its health benefits, which include improving the digestive system, detoxifying heavy metals from the blood, cleansing the liver, and promoting general well-being. Some folks buy fresh wheatgrass and juice it themselves, but many opt for powdered wheatgrass. This is made by drying harvested grass and then pulverizing into a powder, similar to what’s done when making matcha. Then you simply mix the powder with water and toss the funky green concoction down the hatch. A popular brand of grass juice powder in Japan is Aojiru, whose name literally means “green juice.” One of Aojiru’s big selling points is it’s made from wheat and barley grass grown on small farms in a rural area renowned all over Japan for its pristine environment and delicious natural bounty. That’s no minor detail, because if you’re going to grind up a plant and drink it down, then you probably want it to be grown in a nice environment, no? Clean air, clean water, and old-fashioned farming techniques would be nice, yes? Well, you can find all those things in spades where Aojiru’s wheatgrass is grown. This land, whose blue skies and crystal-clear waters are featured in ads in print and on the Internet and TV, is none other than the Aso region, a large area centered around Mt. Aso, an active volcano. Aso is also where some of Japan’s finest teas are grown—such as ours. One of the TV ads for Aojiru that San Francisco’s Channel 26 shows during its Japanese programming includes an interview with a wheatgrass grower standing in one of his wheat fields, with majestic Mt. Aso rising strongly in the background. The farmer speaks in a thick local dialect that is eminently familiar to me—as I lived there for a spell—and to my wife, who was born and raised there. But like anyone who speaks with any kind of accent or dialect knows, even though you don’t think of yourself as having an accent, when you’re away from the motherland (wherever that may be), it’s always jarring to hear someone else speak it. When I lived in Japan, American valley speak stood out a lot more audibly in a sea of Japanese than it ever did back home. But back to wheatgrass juice, a drink that’s getting more and more popular here in the U.S. Actually it’s once again becoming popular here. You can even get shots of wheatgrass juice at Jamba Juice. Speaking of that juice bar chain, here in Livermore, California, one of their wheatgrass suppliers is Grassroots Organic Wheatgrass. I wonder if the proprietors there have ever tried a lawnmower. If you don’t want to eat your veggies then you can drink your veggies. Mellow Monk has just started an affiliate program through Shareasale.com. If you're a blogger or webmaster and think your readers would be a perfect match for Mellow Monk's teas and our philosophy, please give it some consideration. One of our grower's tea groves. Here's a nifty tip for anyone who has—or plans on getting—an iPod or other headphoned device: an easy way to wrap your headphones or other cord without ties or tangles. This way, you get to spend an extra 5 minutes actually listening to your music instead of untangling the cord. With this technique, your cord stays neat and—just as important—unwraps without any tangles. PinkTentacle.com has put up a fascinating list of the Top 60 Japanese buzzwords of 2007. Japan's 2nd—and thus far shortest-serving—minister of defense, Yuriko Koike, a.k.a. "Madame Sushi" (buzzword #9 on PinkTentacle's list). 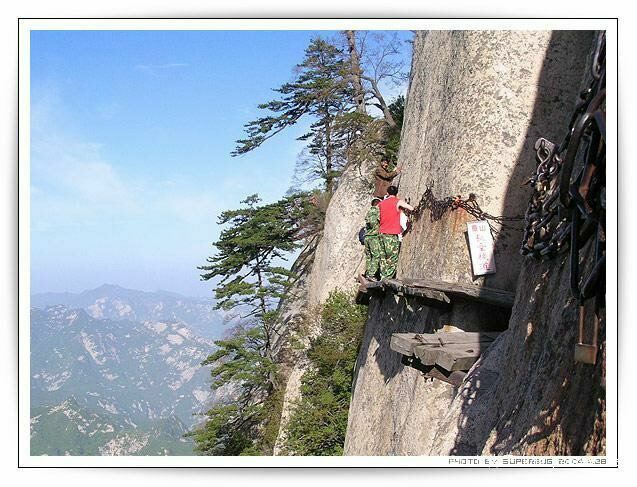 It's not actually the teahouse itself that's scary; it's the steep cliffside path you have to navigate to get to it. These online photos are probably as close as yours truly will ever get to this mountaintop shop, which is located somewhere in China. If anyone knows exactly where this is, please use the comment feature to let us know. Ah, to be young and fearless. This is the time of year when farmers in Sekikawa Village in Niigata Prefecture get busy weaving one of their most popular local products: cat beds (neko chigura). Winter tends to be a slow time for farmers—and a time when cats seek warm places to sleep. Way back in 1980, someone in Sekikawa put two and two together and came up with an idea to fill an unmet need and make productive use of the winter downtime: They would take a traditional baby basket, hand-woven with rice straw (which rice farmers have a lot of on hand), and modify it for the village's mice-catching members. The hand-woven baskets turned out to be a smash hit with cats and their owners, with orders now flooding in from all over Japan. The trouble is, the village's current cohort of 19 weavers can produce only about 500 cat beds a year—not nearly enough to keep up with demand. 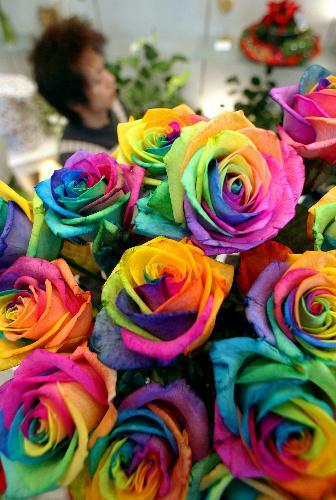 Consequently, if you want to order one (you can find the contact info here) there's a one-year waiting list. Said the kitty right before he attacked the reporter's legs, "Hey, who said you could take my picture?" If traditional Japanese architecture in general and old temples and shrines in particular are right up your ally (so to speak), then the next time you're in Tokyo, be sure to visit the Yanaka area. Yanaka has the largest concentration of shrines and temples of all the districts of Tokyo. How did all those buildings end up there? Well, it seems that during the Edo period, the shogun ordered all the temples concentrated in the city's center to relocate to Yanaka, which at the time was the outskirts of town. The move was intended to create firebreaks in the crowded city—the shrines' thatched roofs were know to burn violently when a fire broke out. The above is from Frommer's Walking Tours: Tokyo, according to which you can walk the highlights of Yanaka in about 4 hours. At the entrance of Suwa Jinja (Shrine), in Yanaka, Tokyo. One way to get drivers to maintain the speed limit is to ticket them when they go over the limit. Another way is to carve a long series of parallel grooves across the road's surface so that cars traveling over the grooves at just the right speed will hear a melody. These "melody roads" are designed so that the blacktop ballad will sound just right only if you drive over the grooves at just the right speed—the speed limit. If you've never heard "Miagete Goran" before, watching the bottom video first will help you detect the tune in the "melody road" video. Still, I can't help thinking that "Look Up" is not the kind of message to send to people while they're driving. . . The road that plays "Miagete Goran"
Kyu Sakamoto singing "Miagete Goran"
A study showed that college students who spent 20 minutes each day learning a meditative technique called integrated body-mind training (IBMT) exhibited less stress than students who merely studied how to relax muscle groups. Not only that, but the first group (IBMT-ers) did better on tests of attention and mood and produced lower levels of cortisol (a.k.a. the "stress hormone"), which is something that you do want to keep low. "Meditation" is the title of this piece of digital—yes, digital—art. Click on the above pic to view the full-sized version, which really is nice and mellowing. 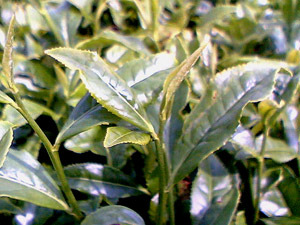 A study published in the journal Breast Cancer Research and Treatment reports how a catechin in green tea inhibits breast cancer. 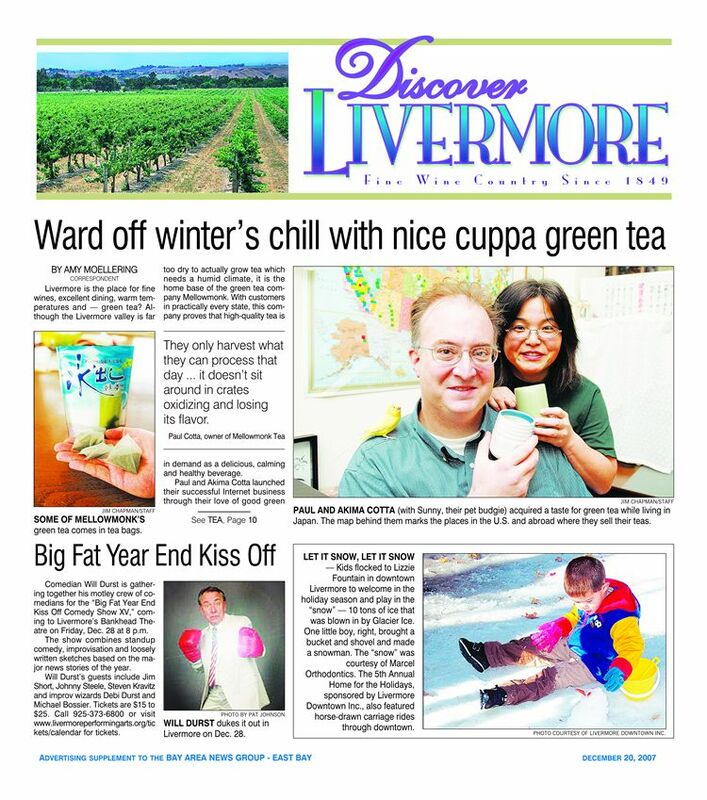 The paper explains that the catechin epigallocatechin gallate (EGCG)—which is found only in green tea—blocks the activity of an enzyme that regulates the metabolism of the fatty acids that are necessary to the survival of breast cancer cells and most other common types of human cancer cells. The structure of the amazing molecule EGCG.